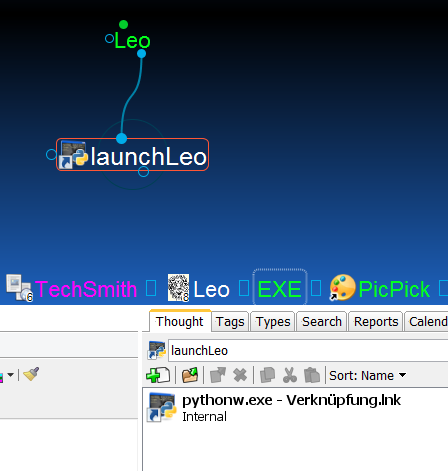 I've a Python file (launchLeo.py) that is launched with pythonw.exe. 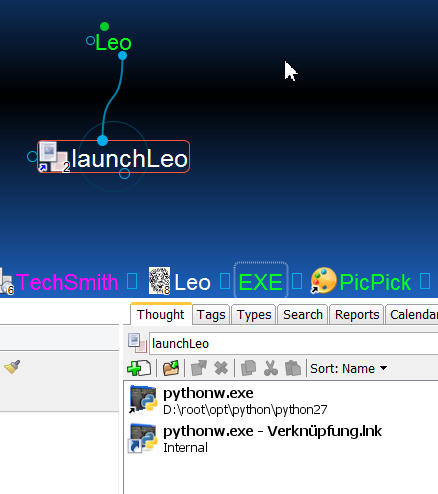 The launching is encapsulated in a link file sitting on my desktop. If I drag and drop this link file into a brain, the link functionality is lost (see video). If I copy the file link and paste it in the plex directly to the thought, everything works fine (see first picture; the entry in the 'Thought' tools tab shows, that it is file link). But with dragging an dropping, some information in/about the file link gets lost (see second picture, first entry in the 'Thought' tools tab). If doesn't matter if if the file link is dragged directly onto a thought, or into the plex as a new child of a thought, or into the work area of the 'Thought' tools tab.